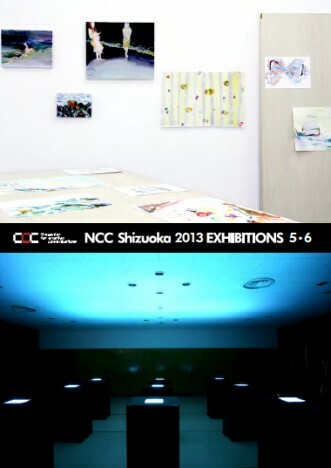 “NCC-Shizuoka 2013” is the center for creative communications’ exhibit competition which called for entries from Shizuoka Prefecture residents. After careful selection, 10 winners were chosen to present their exhibitions here at CCC. Between July and November CCC will be hosting 2 exhibits at a time. Part Three will show the exhibits “Hyouchakubutsu (Flotsam)” by Ayano Hagiwara and “Kono Chijo-de Iki-wo Suu-koto, Haku-koto” (Living & breathing on this earth) by Tomomi Furuya. The exhibition “Hyouchakubutsu” shows her recent simple frame series. Each of these works has a subtitle – chosen carefully but without too much meaning attached – of words from examples in a dictionary. This simple frame series addresses what happens after the beginning phases of a simple framework and rules have been thought up. In the exhibition “Kono Chijo-de Iki-wo Suu-koto, Haku-koto”, Water-filled resin balls are place on top of CRT displays, each reflecting images. Sometimes slow, sometimes fast, just like a heartbeat.